If you're planning to stay in your current home throughout your retirement years, consider incorporating an attractive and safety-conscious tub into your bathroom design. When you include a Safety Tub in your bathroom, you'll enjoy the luxury -- and safety -- of being able to enter your bathtub via a walk-in door rather than having to step over a potentially dangerous raised side. No matter what age you are or what physical condition you're in, with a safety tub you'll enjoy easy access to your bathtub. You'll be able to get in and out of the tub without exerting yourself or risking injury or a fall. Safety Tubs make it possible for senior citizens and people with a wide variety of physical disabilities to remain independent, and avoid having to rely on the assistance of other people to enter and leave the bathtub. inches from the bottom of the tub. They won't have to struggle to sit down or get up, further reducing the chances of experiencing bathing-related injuries. They will, however, be able to enjoy a luxurious soak, as these tubs are almost twice as deep as standard bathtubs. Safety Tubs are specially designed to avoid leaking water, so there's no concern about making a huge mess or dealing with puddles of water on the floor. The tubs are made using modern hydrostatic technology, which ensures a leak proof seal tight enough to keep the water in. 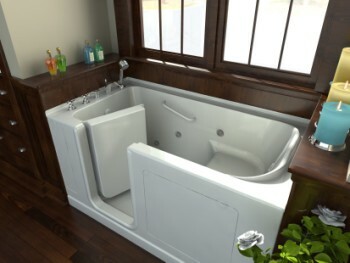 The tub's door handle is easy to operate, and the unit fills and empties quickly. You can also mount a hand held shower on the wall for your convenience. It's easy to incorporate a Safety Tub into your bathroom remodeling plans, as the tub is designed specifically to fit in the same space as a standard bathtub. You can easily install a safety tub in the same spot as the traditional bathtub you're removing and replacing the next time you overhaul your bathroom design. For more product details, see www.safetytubs.com.